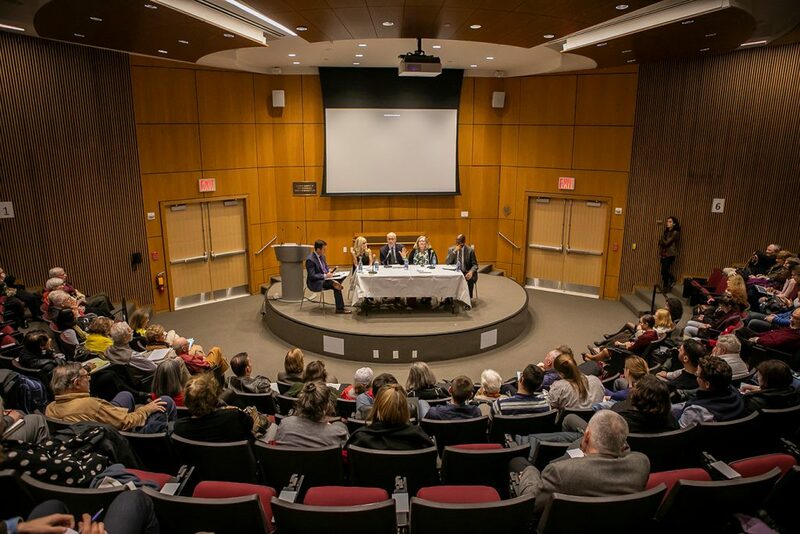 The pain of thousands of sexual abuse victims weighed heavily on the minds of a group of panelists at the Lincoln Center campus on Monday, Oct. 29, as they addressed the widespread instances of sexual abuse in the Catholic Church. “What Happened? Why? What Now? Clergy Sexual Abuse in the Catholic Church” brought together experts in law, psychology, and theology to talk about new developments in the ongoing crisis, such the Pennsylvania Attorney General’s August report detailing how more than 300 Catholic priests there sexually abused children over seven decades and were protected by a hierarchy of church leaders. It was the first in what organizers said will be a series of events dedicated to the crisis, and was preceded by a full minute of silence in honor of the victims. Erin Hoffman, associate director of Campus Ministry for Spiritual and Pastoral Ministries at Lincoln Center, and director of Ignatian Initiatives, leads the gathering in a moment of silence before the discussion. The first highly publicized incident of abuse, involving a Louisiana priest who was convicted of pedophilia in 1985, was dismissed as an aberration, Massingale said. Then in 2002, the Boston Globe published a report showing the abuse was more widespread, but it was still seen as an American phenomenon confined to wayward priests. Now, he said, victims are coming forward from around the globe, which is proof that the whole church hierarchy is to blame. The entire process of priest formation needs to be reformed, he said, with less emphasis on the virtue of obedience. “What we’re seeing is an interrogation of a monarchical system of power, where the people who have power in the church are not accountable to anyone except the person above them, and there are no women in the chain of command, and no lay people in the chain of command,” he said, noting that few outside the church believe church leaders are capable of policing themselves. It turns out we were the leading edge of a wave of that’s now breaking around the world, said David Gibson. 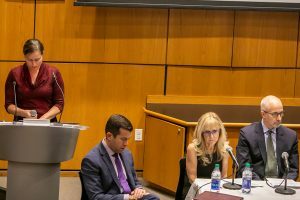 M. Cathleen Kaveny, Ph.D., the Darald and Juliet Libby Professor of Law and Theology at Boston College, concurred, and said it’s important that the church submit itself to appropriate legal procedures and use secular best practices to make sure the abuse never happens again. 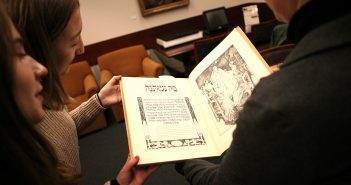 “At the same time, its extremely essential that we use and develop our own theological and ethical language to understand why this is a problem, not just for citizens in the secular society who are harming one other, but also for fellow members of the body of Christ, to see how that is harming us as church,” she said. The relationship between priests and bishops was a major point of discussion. Father Massingale noted that at its best, the relationship takes on a benevolent father-son dynamic. At its worst, a priest can become psychologically dependent on the bishop, thus becoming vulnerable to being used to cover up for him or for others. 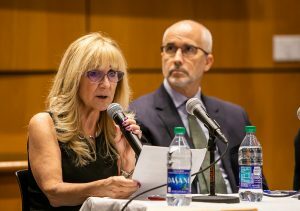 Celia B. Fisher, Ph.D., the Marie Ward Doty University Chair in Ethics, professor of psychology, and director of Fordham’s Center for Ethics Education, echoed Father Massingale’s strenuous assertion that homosexuality is not in any way connected to the abuse perpetrated by priests. 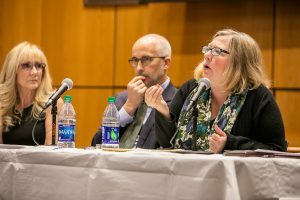 M. Cathleen Kaveny said Catholics must develop their own theological and ethical language to understand why the abuse crisis hurts fellow members of the body of Christ. 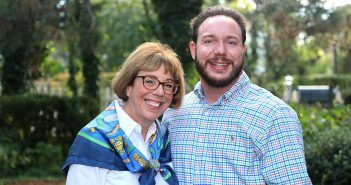 Men who molest young boys are immature heterosexuals who find themselves identifying more as a child than as an adult, she said. She noted that national studies have found that priests who have abused children do not display evidence of mental illness or urges associated with pedophilia. And covering up the abuse, Fisher said, has only compounded and spread the pain further. “People who are deeply religious are more likely to believe in the power of forgiveness, however the severity of harm perpetuated on children, the violation of the clerics’ position of trust and moral authority, repetition of abuse by individual clerics, and the past unwillingness of the church to recognize these problems is making forgiveness difficult for many Catholics,” she said. To the question of why, David Gibson, director of Fordham’s Center of Religion and Culture, added, “Why now?” For starters, he noted that in 2002, American bishops went after the “low-lying fruit,” by focusing on priests and exempting themselves from scrutiny. Celia Fisher cited studies that have found that men who molest young boys are immature heterosexuals who find themselves identifying more as a child than as an adult. “I remember talking to a bishop I’ve known pretty for a pretty long time. I said, ‘What about you guys?’ And he said to me, ‘I don’t even know how you fire a bishop,’” he said. Gibson said that the Pennsylvania grand jury report added narratives to what had previously been dry statistics, and their impact was heightened by the revelations of Cardinal McCarrick’s conduct that had come out just a month before. Just as important, Gibson noted, is that conservative Catholics have come out in favor of investigations they’d previously resisted, and law enforcement officials are no longer turning a blind eye. Finally, he said, it’s become apparent that the problem is not confined to Anglophile countries such as the United States, Ireland and Australia. “It turns out we were the leading edge of a wave of that’s now breaking around the world, in places like Chili, Guam, Mexico, Poland, and Italy,” he said. 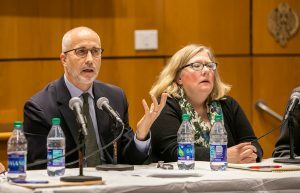 The panel was co-sponsored by Fordham’s Department of Theology, Francis and Ann Curran Center for American Catholic Studies, and Institute on Religion, Law, and Lawyer’s Work. Moderator J. Patrick Hornbeck II said this is just the first in series of events dedicated to the crisis.